Belief in guardian angels goes back thousands of years. But these heavenly guides don’t always just appear and tell us what to do, as Clarence does to George Bailey in “It’s a Wonderful Life.” Sometimes it’s more subtle, with guardian angels carefully introducing images and suggestions to nudge and guide us toward the right choice. All we have to do is pay attention and follow the signs. The Guiding Light Necklace is your very own guardian angel, designed to look over you while you wear it. Made from .925 sterling silver and finished with genuine Italian gold, the elegant design of the Guiding Light Necklace will steer you in the right direction. 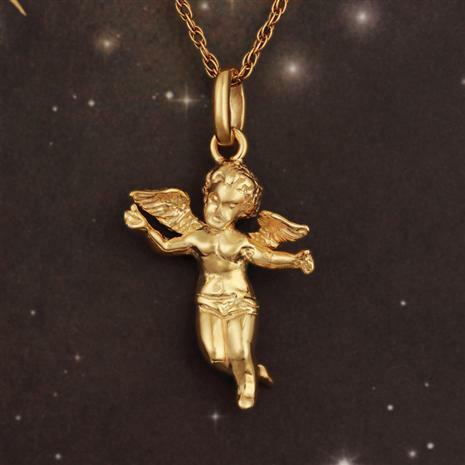 Priced a heavenly value, when you wear the Guiding Light Necklace you face every tough decision safe in the knowledge your guardian angel is right there. All you have to do is follow the signs.